Color(s): White. Markings of black, yellow, or fawn. 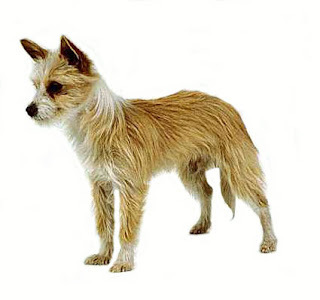 The podengo was developed in portagal and is known as a national breed of portagal, primarily they are found in three sizes GRANDE(large) MEDIO(Medium) and PEQUENO(Small) the small one PEQUENO is known as a hunting dog for rabbits and is not good for other small pets and animals. This dog breed is energetic enthusiastic and bold in nature, they easily adjust themselves in new environments, they are a really tough breed, they can adjust them self in every climate whether its hot or snow they show equal results. This breed of dogs are cheerful and playful and very loyal to their masters they are good with older children and show good behavior towards strangers, the podengo portuguesos are good with other pets and small animals, they are also known as a excellent watchdog and have a tendency to alert their family of any unwanted situations. Because of their nature this breed is not good for first dog owner. The Podengo have two different types of coat one is smooth and other one is rough: the smooth one is medium in length and of hard texture where as the ROUGH coat is longer in length and shaggy to look at. This dog breed needs early socialization and obedience training, they are a good learners and learn easily and sharply but training must be given with patience. They do not respond to harsh and hard training methods, this is to remember that the training should never given to them before six months of age. As they are hunting dogs they need a lot of exercise and for that there should be a fenced yard. This breed of dogs is not suggested for small apartments. They love to go for daily walks and play games with their owners. Brushing should be done occasionally to remove dead hair, bathing should be done when mandatory with dry shampoo. Dental hygiene for this breed is extremely important. Otherwise this is a healthy breed of dog which does not have many breed related health problems and dog diseases.